Certain division of a tournament may be a doubles competition. This is a popular format for racket sports. 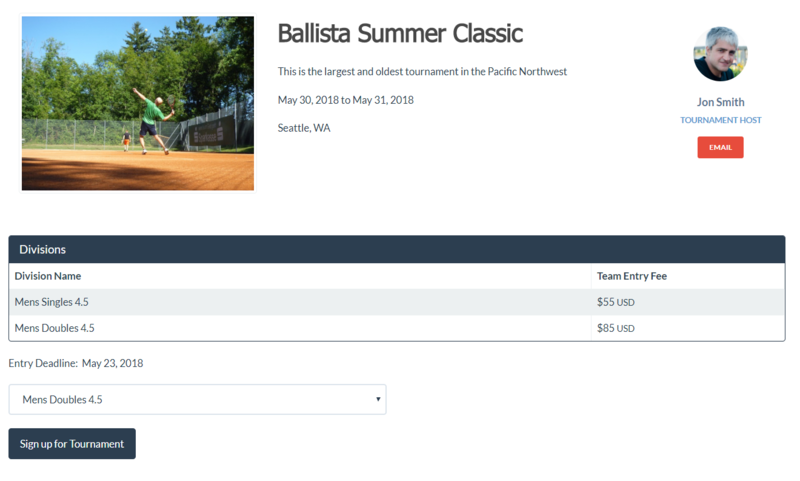 In order to enter a doubles team in a tournament, first select your desired division from the tournament page. 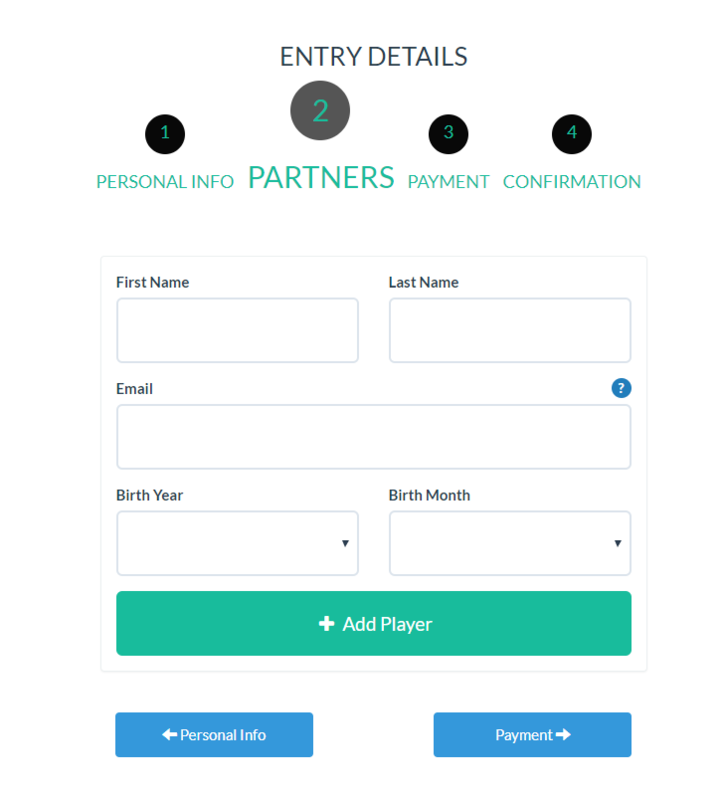 After you select your doubles division and press Sign up for Tournament button, you need to complete a multi-step form to enter your team in the tournament. First, you need to provide your personal information. After you submit your name and your email, you will be presented a confirmation screen like the one below. 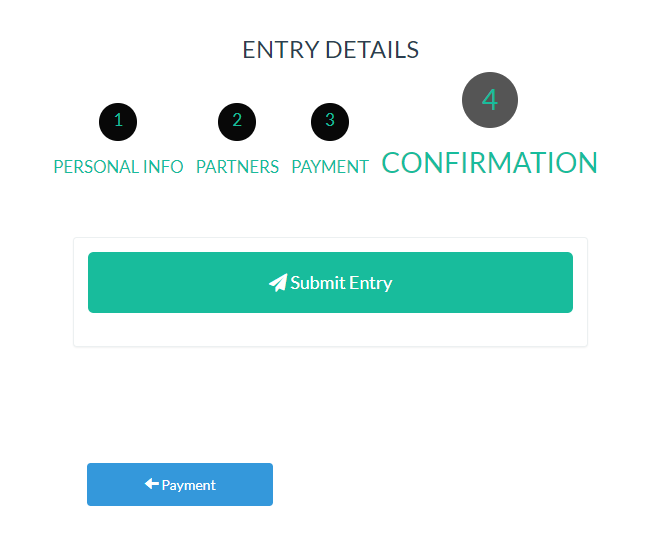 To simplify your entry, we assume that you are one of the players. Therefore, first player's information is partially filled by your personal information. 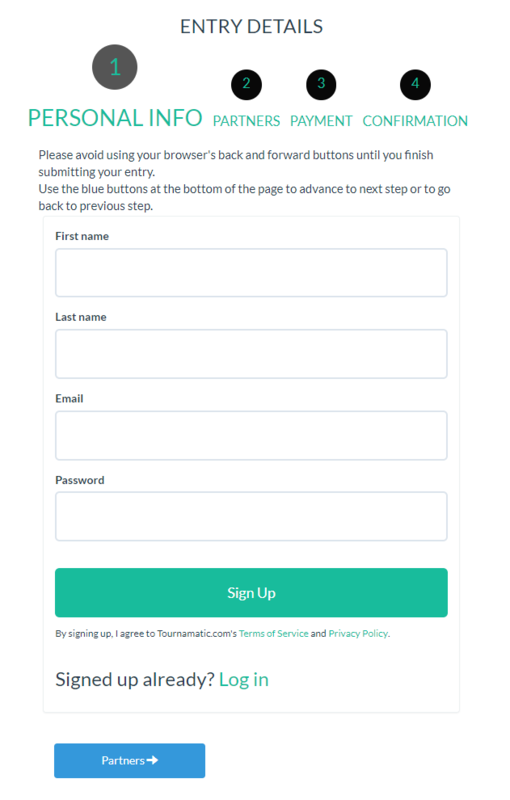 In case you are signing up other people (for example you are a parent and signing up your children), you can remove your information and enter the first player's information instead. Next step is to add a partner. So just go ahead and do that the same way you entered the first player. You are required to enter two players in total, no more and no less. 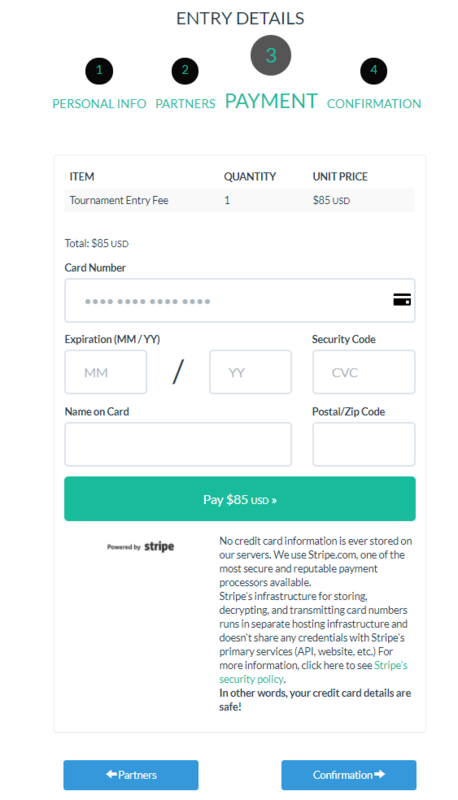 Use a valid credit card to pay the entry fee set by the tournament host. In addition to entry fee, there might be additional items that are offered by the tournament host. You can add any of those add-on items (in desired quantities) to your shopping cart and the grand total of your payable amount will update accordingly. These additional items can be T-shirts, tickets to social events or any other items that might be offered by your tournament host. Remember that you are paying for both players and it is on you to collect other players share of the entry fee. 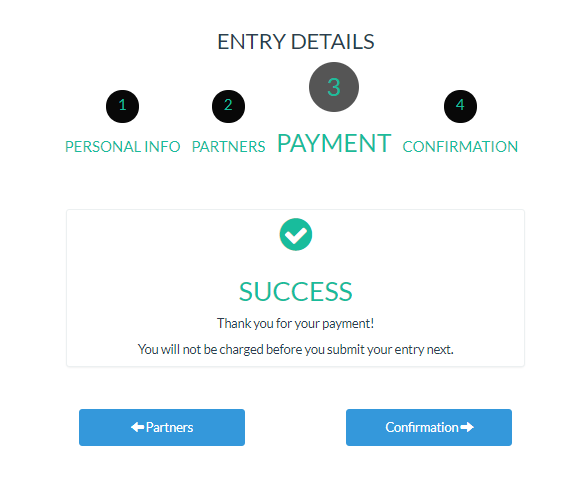 If your payment is processed successfully, a confirmation screen like below will be displayed. Additionally you will receive your payment receipt via email. 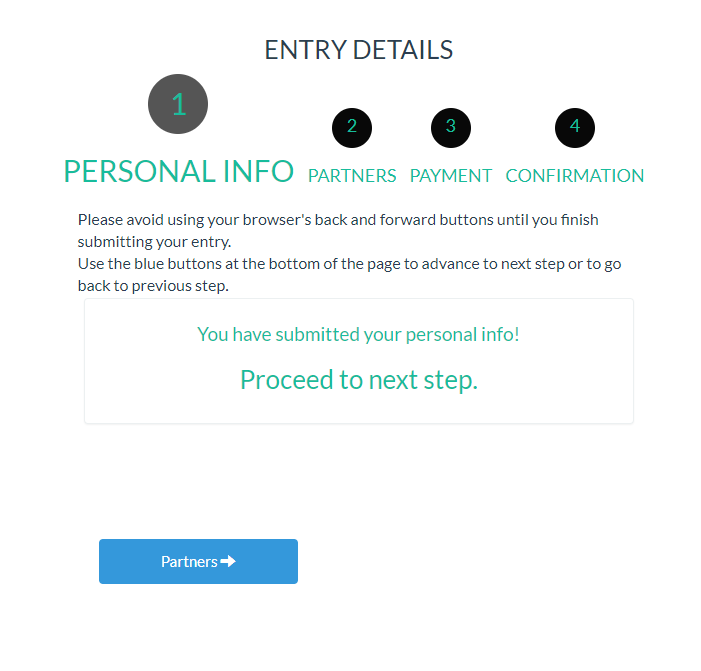 After you confirm your entry, a success message will be displayed. Consequently, you should receive an email with some additional information. Your team name will be a combination of players' last names. For example if John Smith and George Davis are partners, their team name is "Smith|Davis". Your tournament host will also receive an email notifying him or her that you entered a team in the tournament. Each partner will also receive email notifications (assuming that you provided their emails when you were adding them in Partners step).